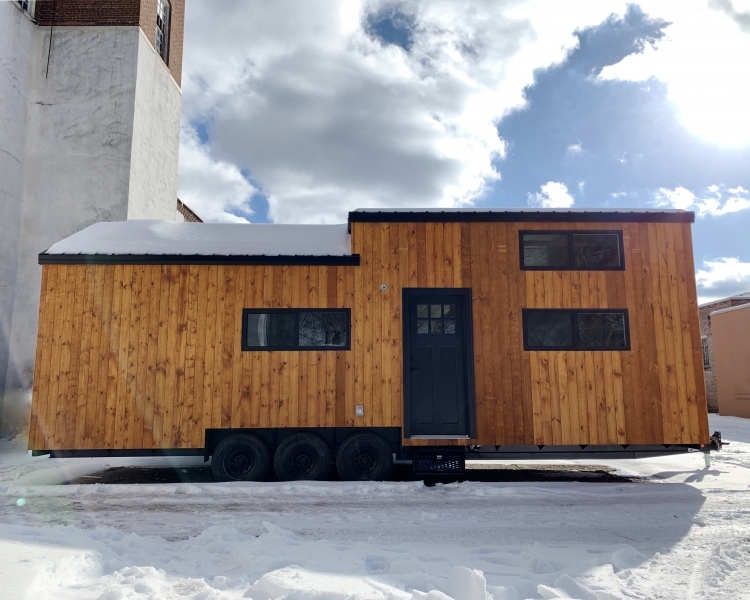 The Hoosic is a river that winds off the Hudson through the Taconic Mountains of New York, the Green Mountains of Vermont, and the Berkshire Mountains of Massachusetts, eventually passing right in front of B&B’s tiny house workshop. 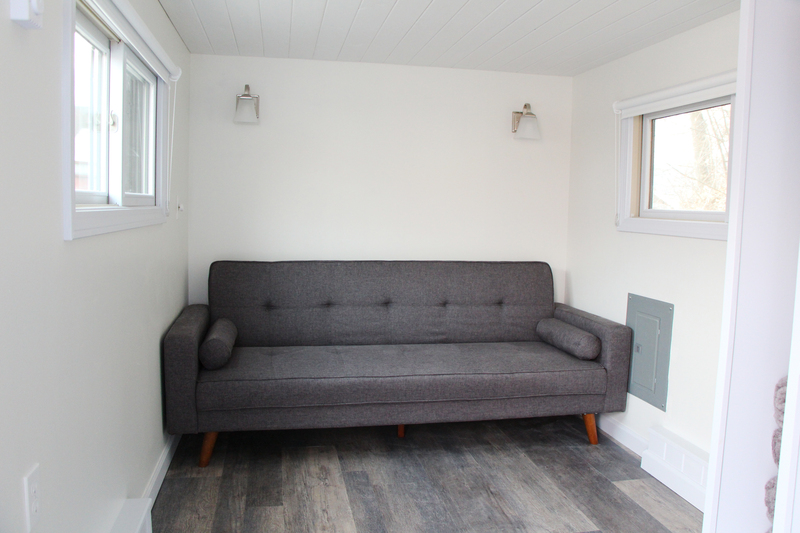 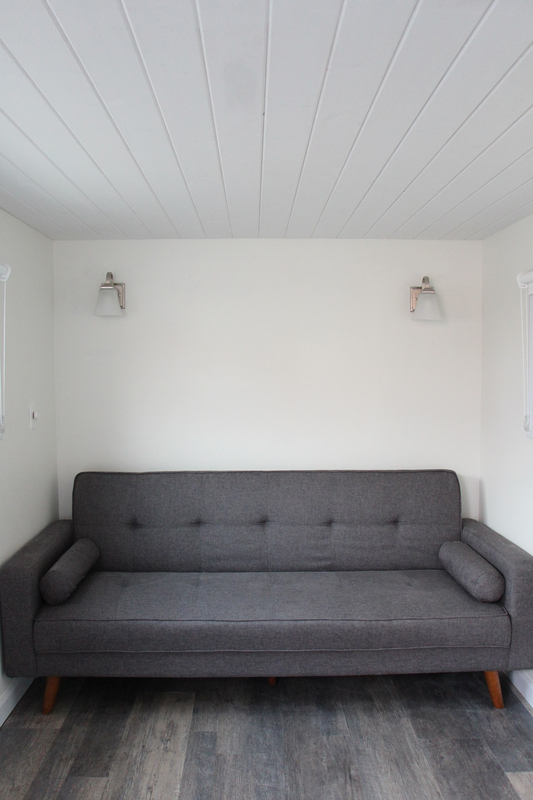 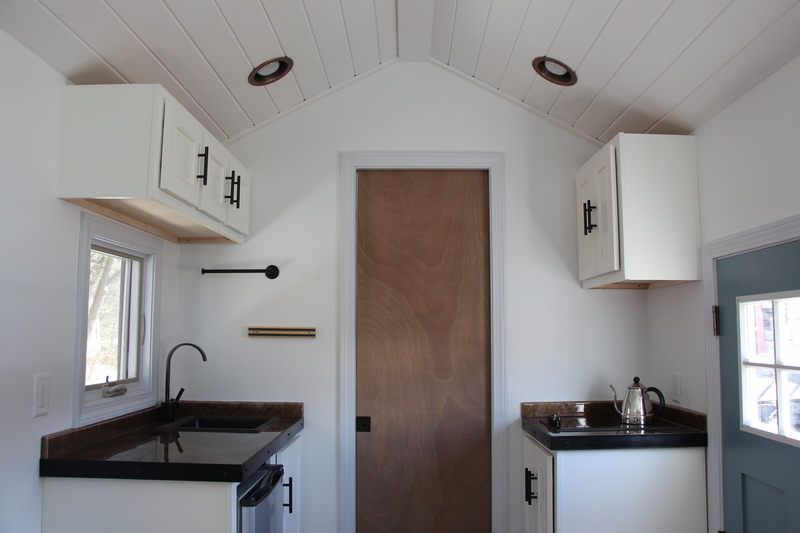 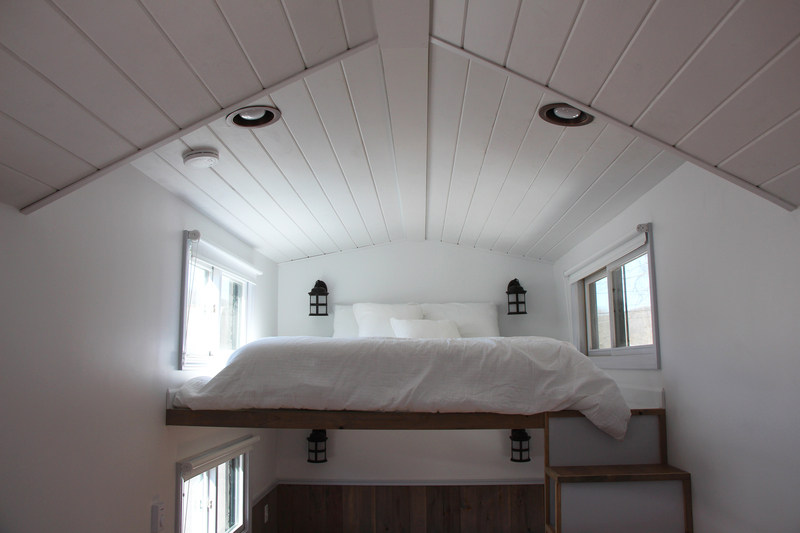 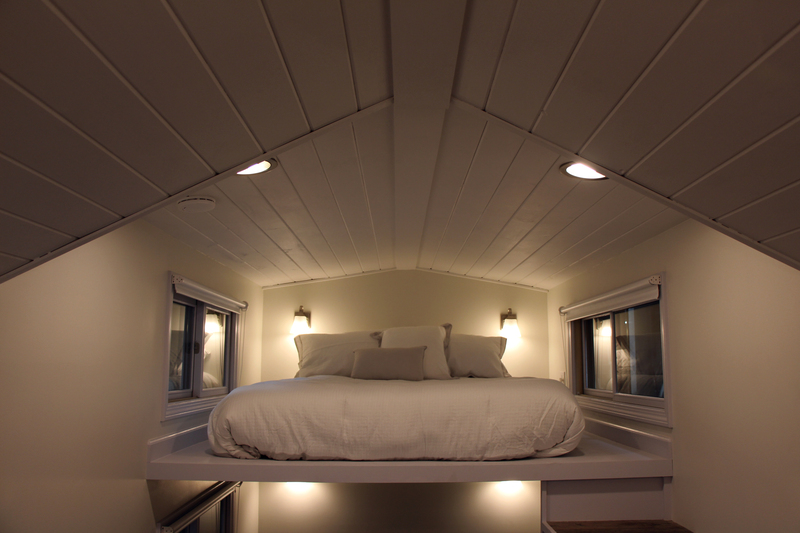 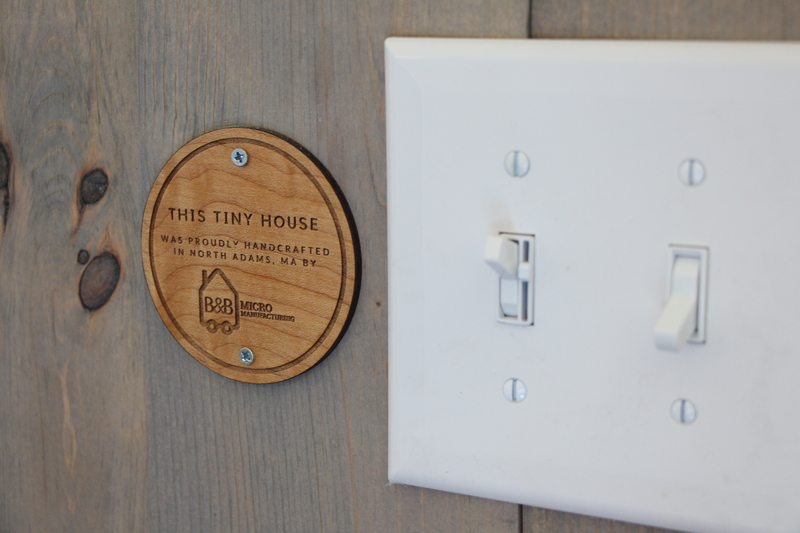 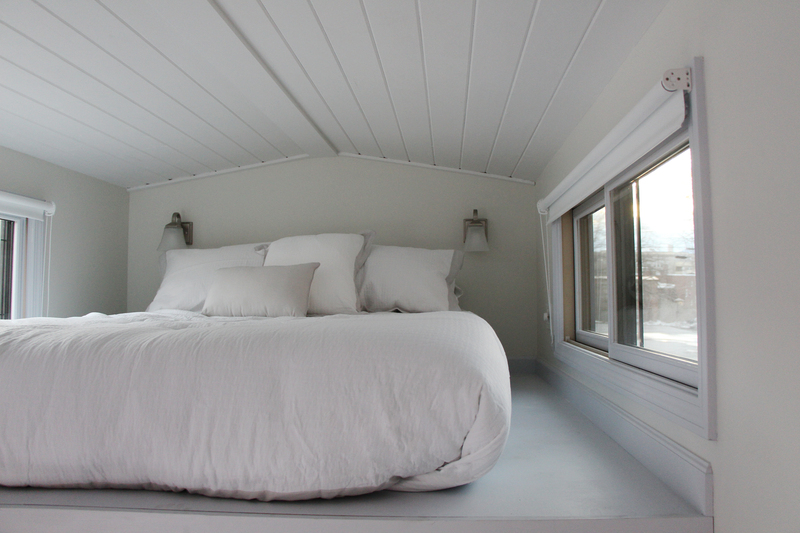 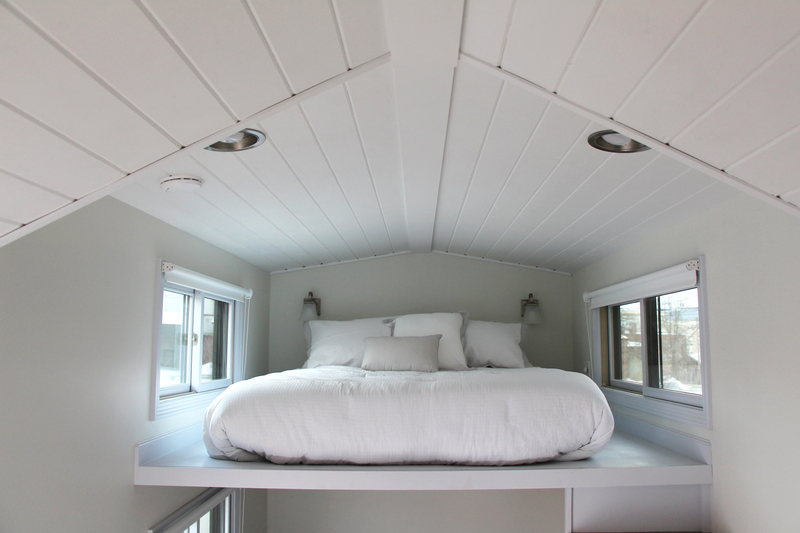 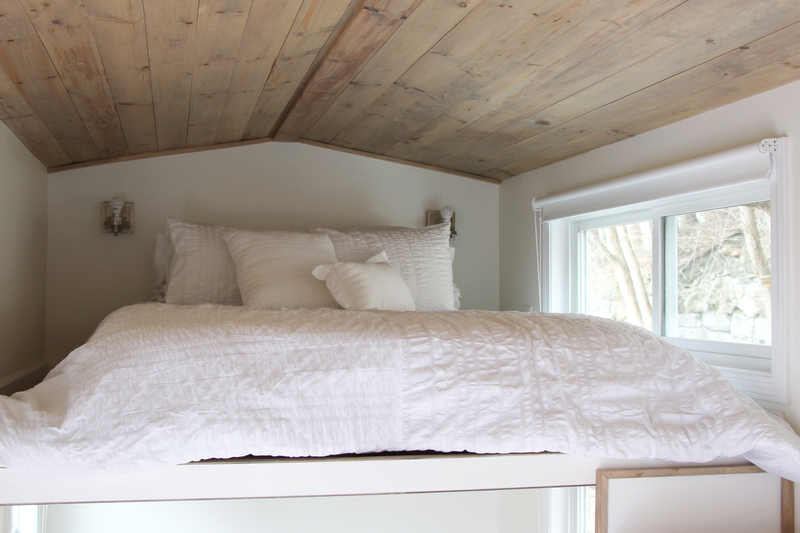 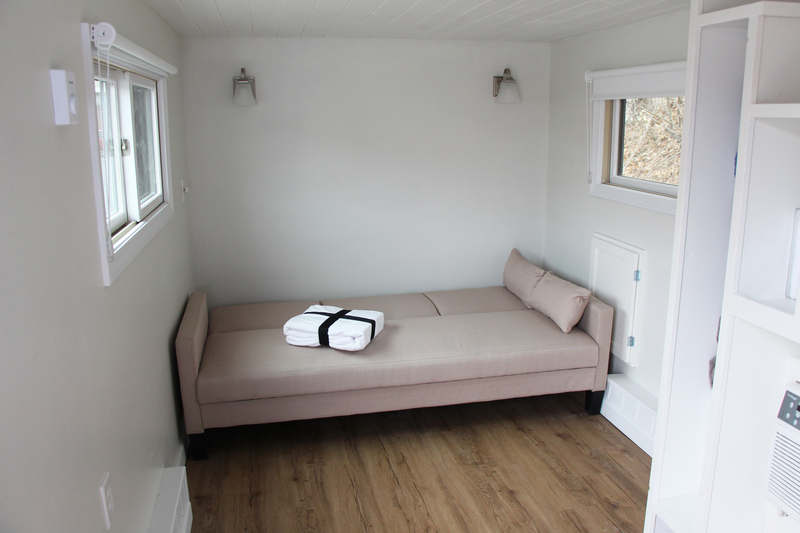 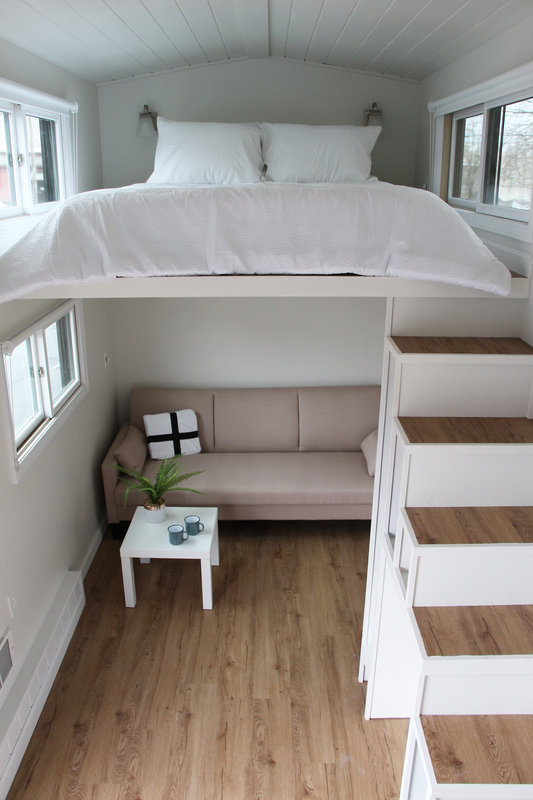 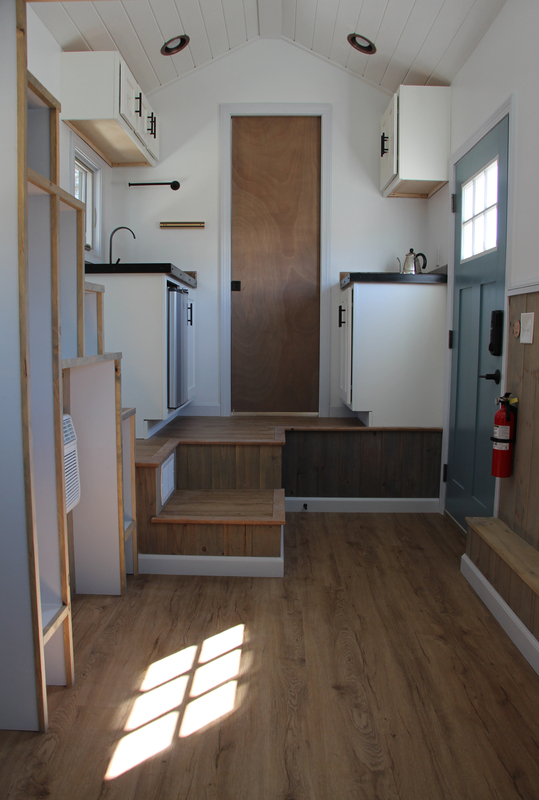 The Hoosic Tiny House is a handcrafted, RVIA-certified tiny house on wheels with a queen size lofted bed. 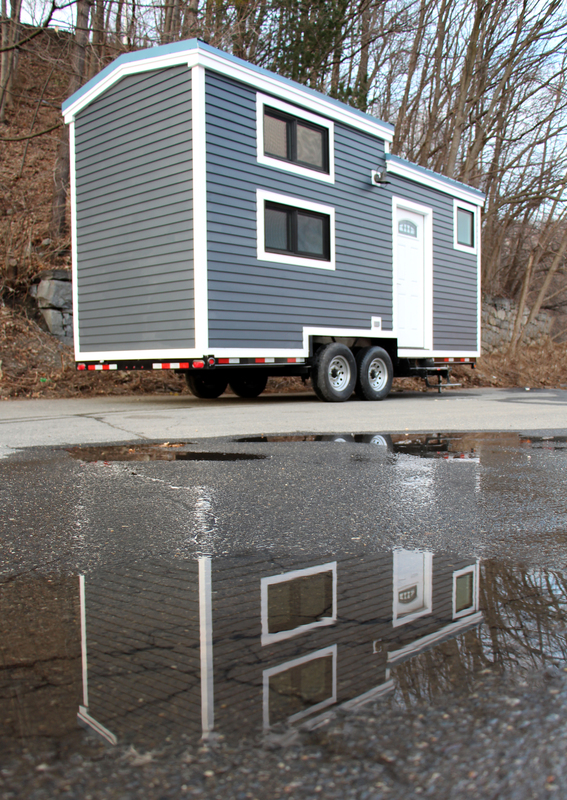 The Hoosic’s starting price comes with everything pictured in these three models. 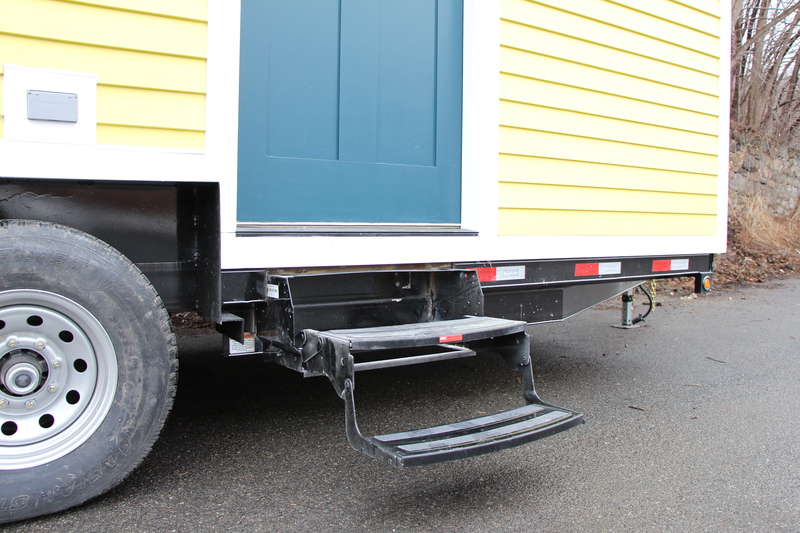 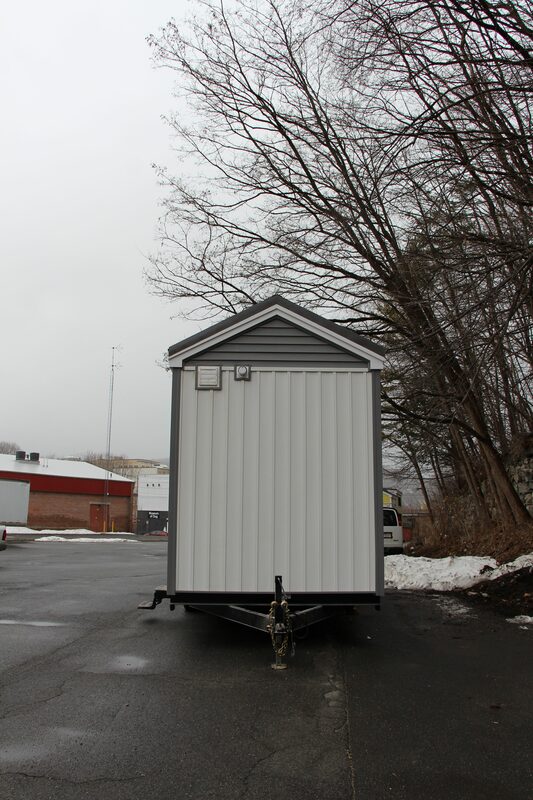 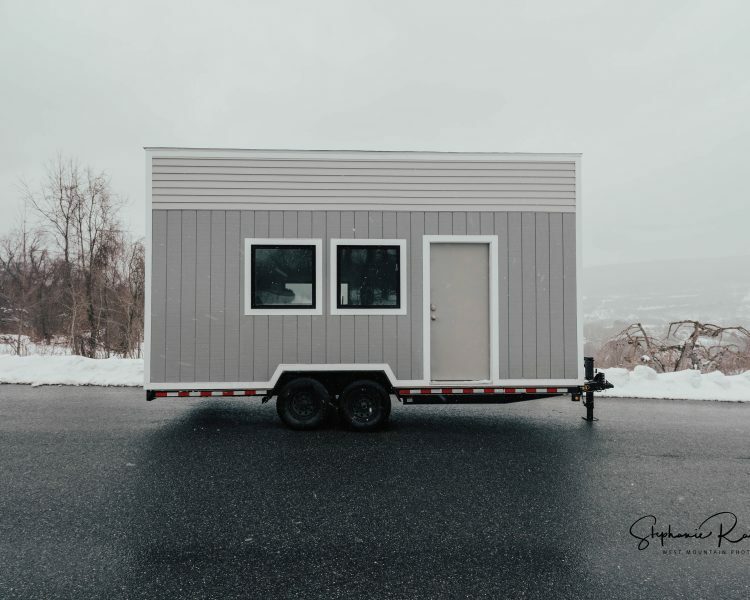 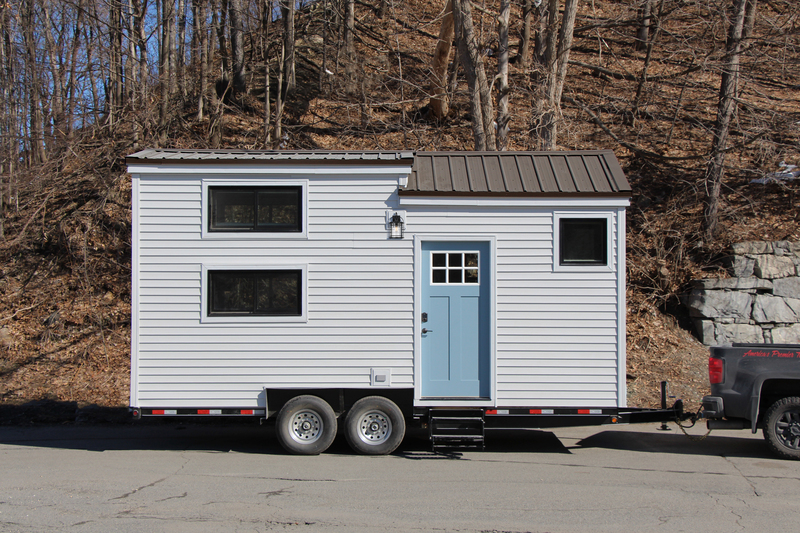 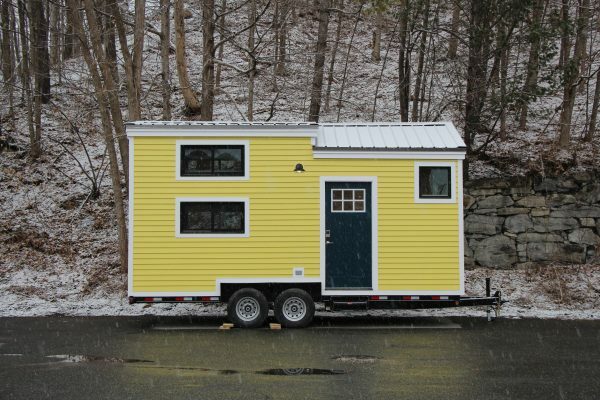 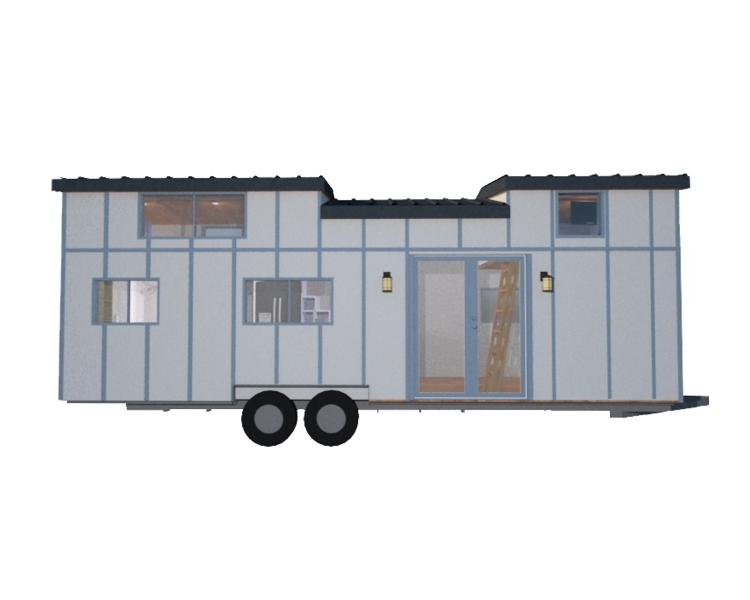 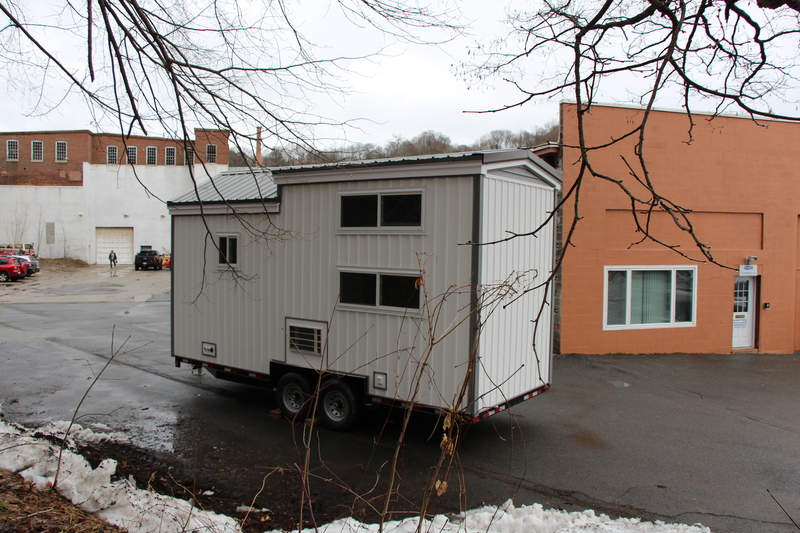 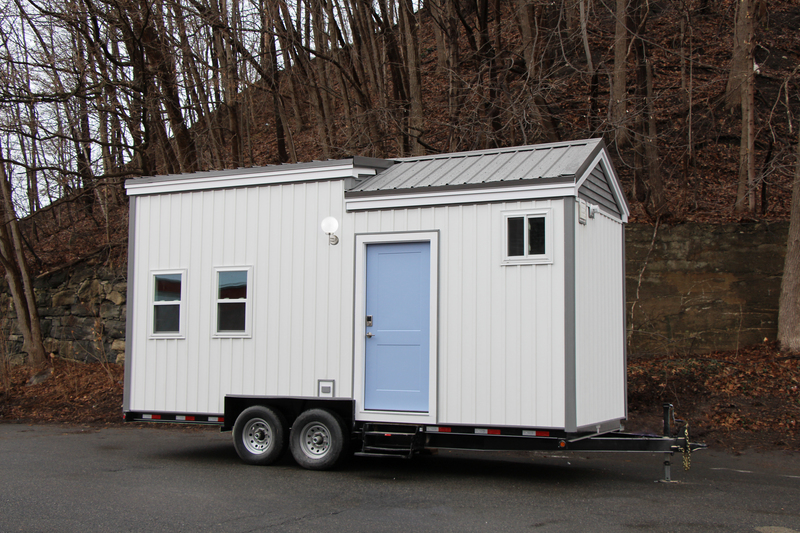 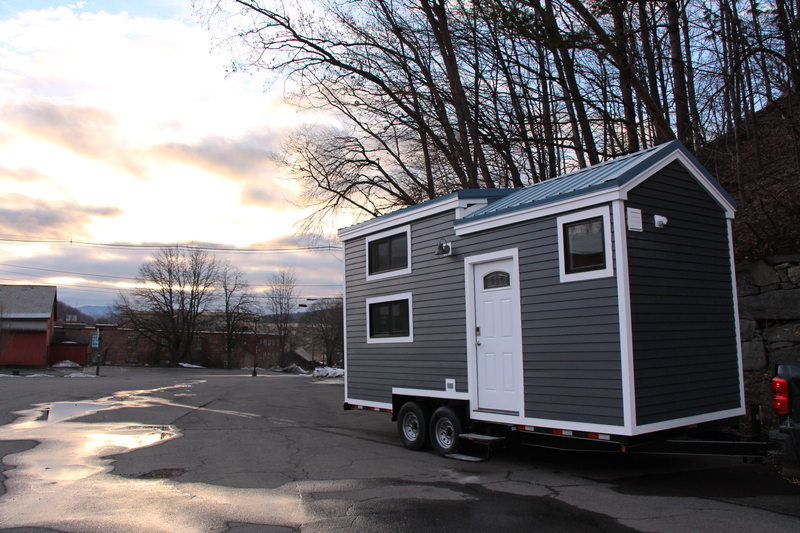 The Hoosic Tiny House is the road-legal maximum width of 8 1⁄2’. 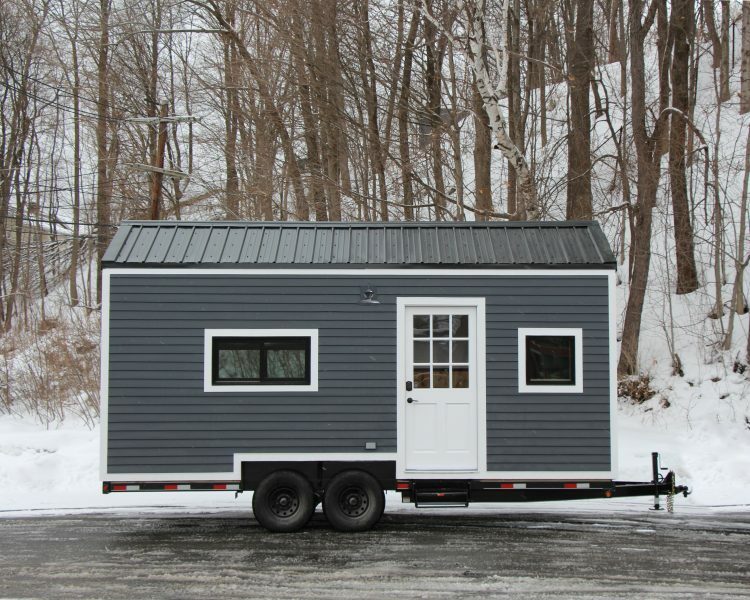 The height of the roof peak is within the road-legal maximum of 13 1⁄2’. 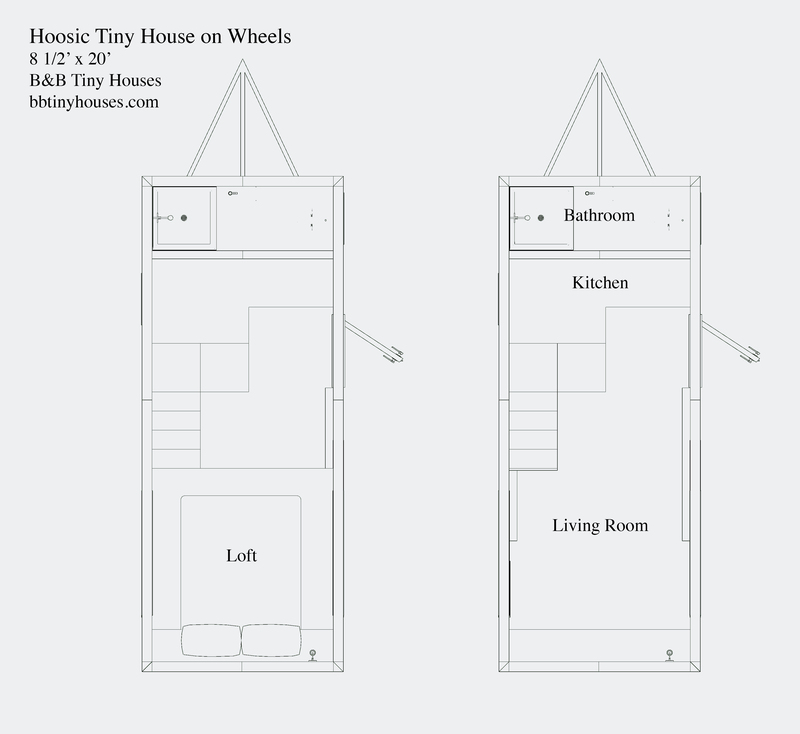 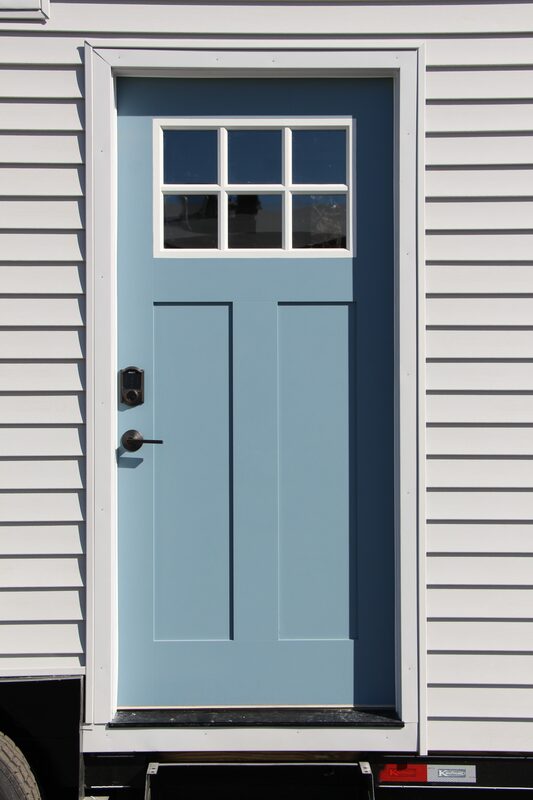 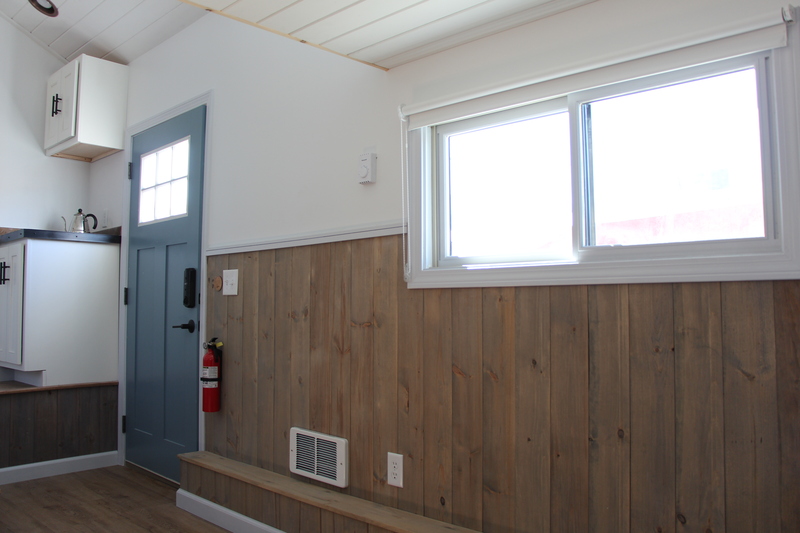 The standard length for this house is 20’: please inquire about lengthening the house up to 40’. 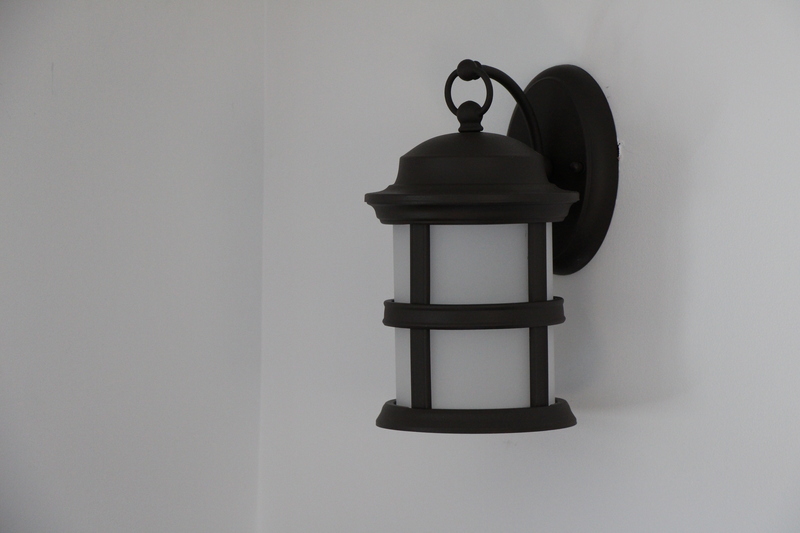 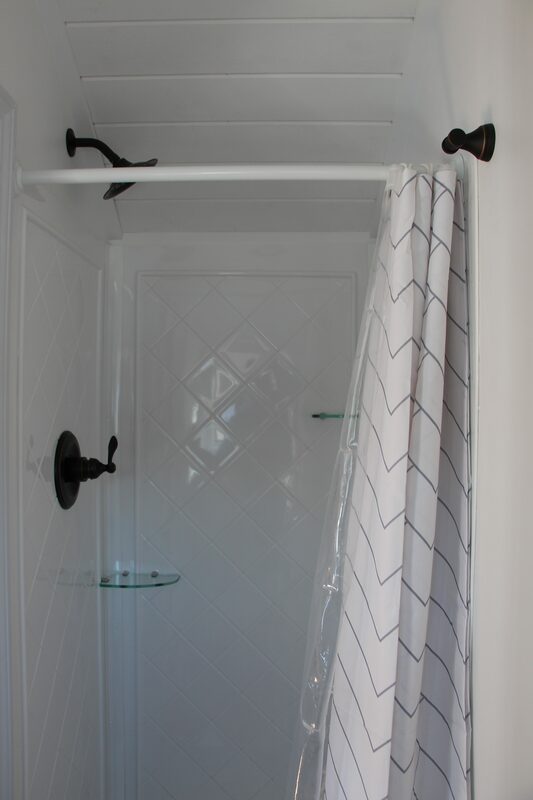 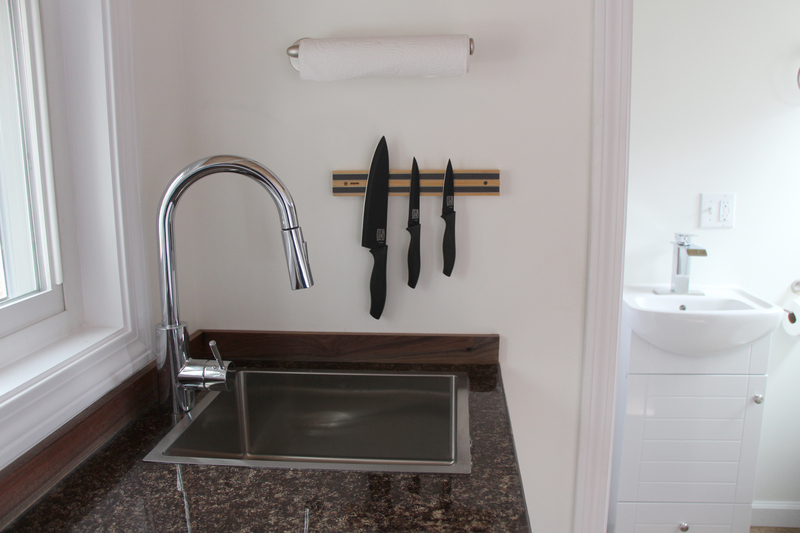 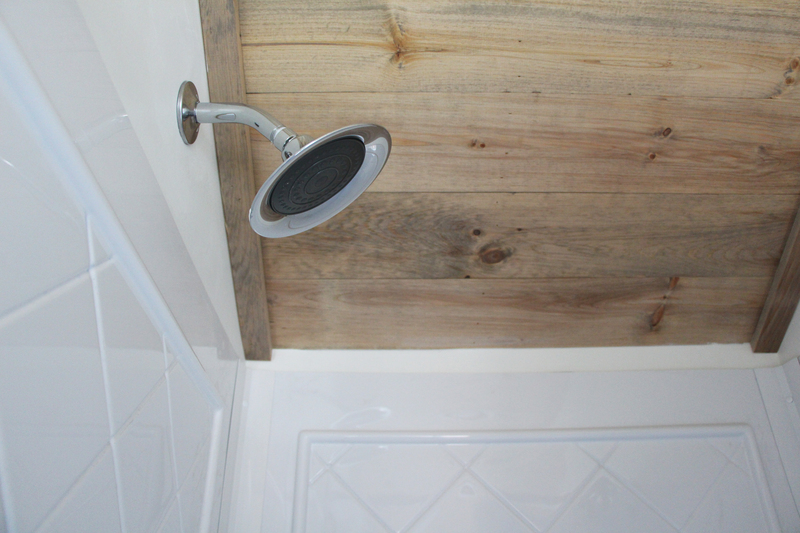 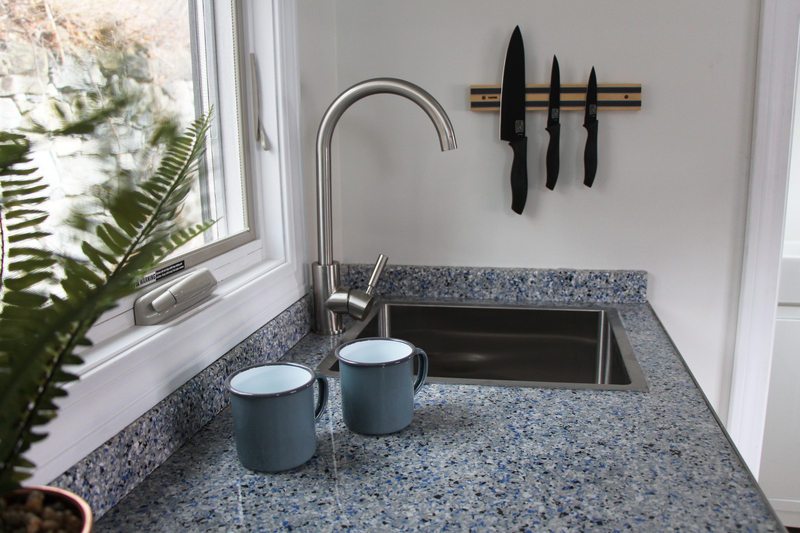 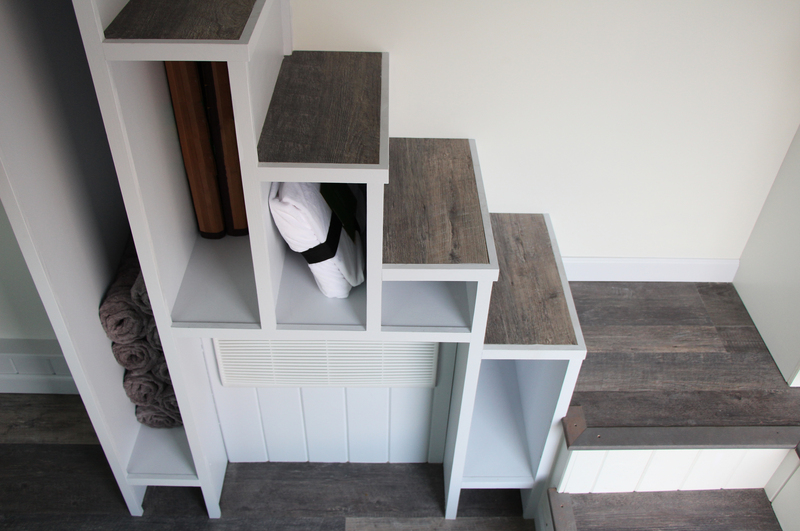 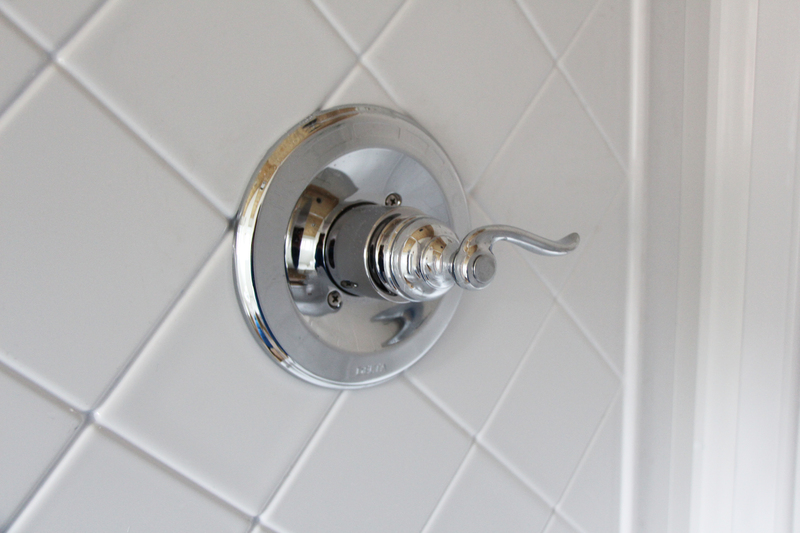 Design details are entirely customizable for the customer’s taste and lifestyle. 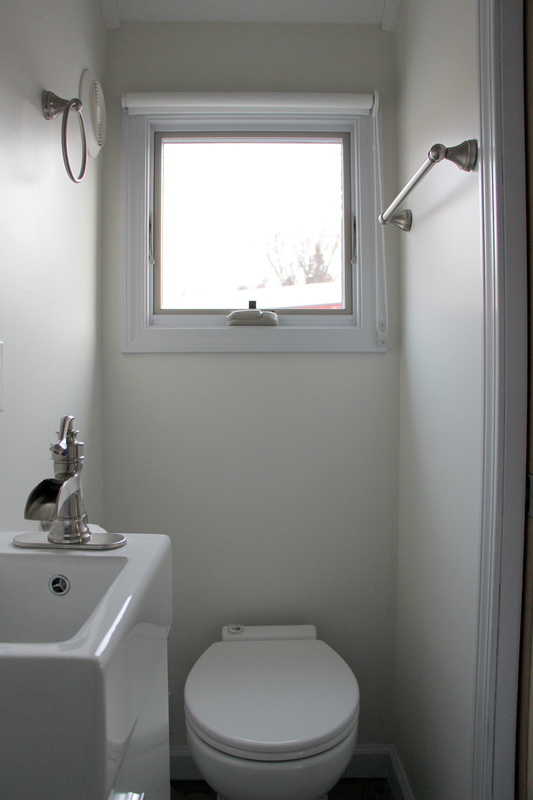 Windows on both sides let light and views in. 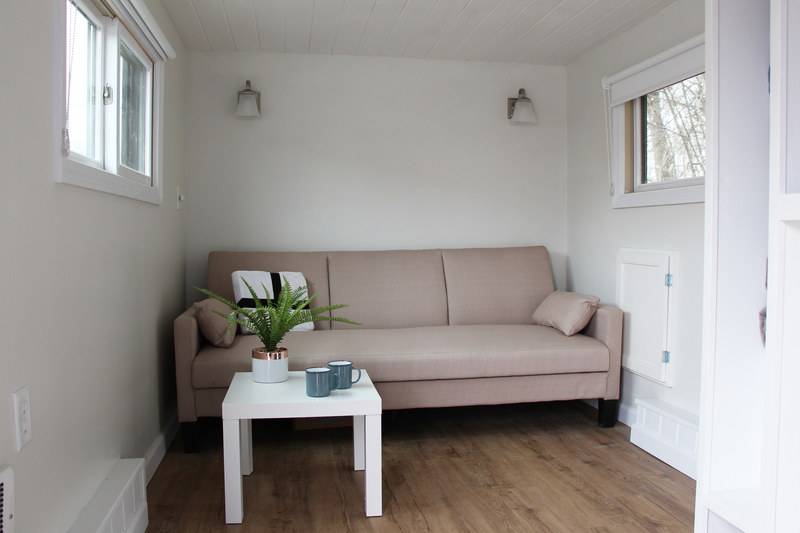 The living room is a cozy space with room for a coffee table and convertible sofa (allowing the house to sleep up to 4). 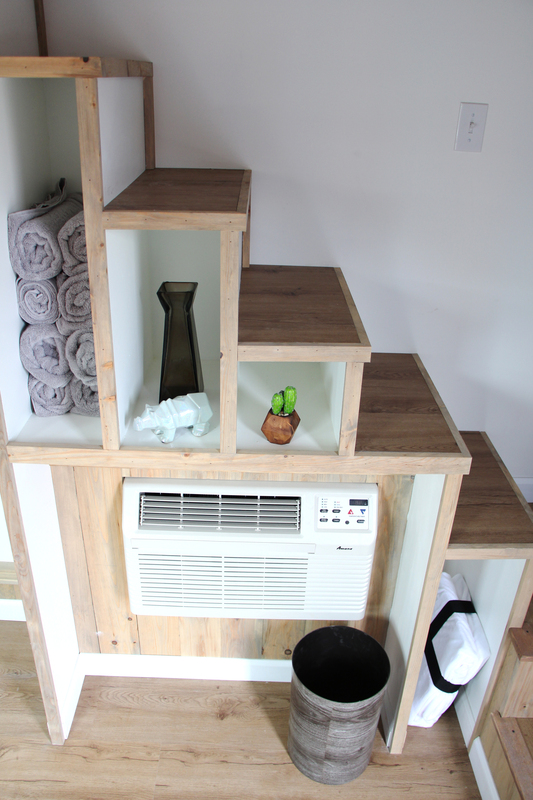 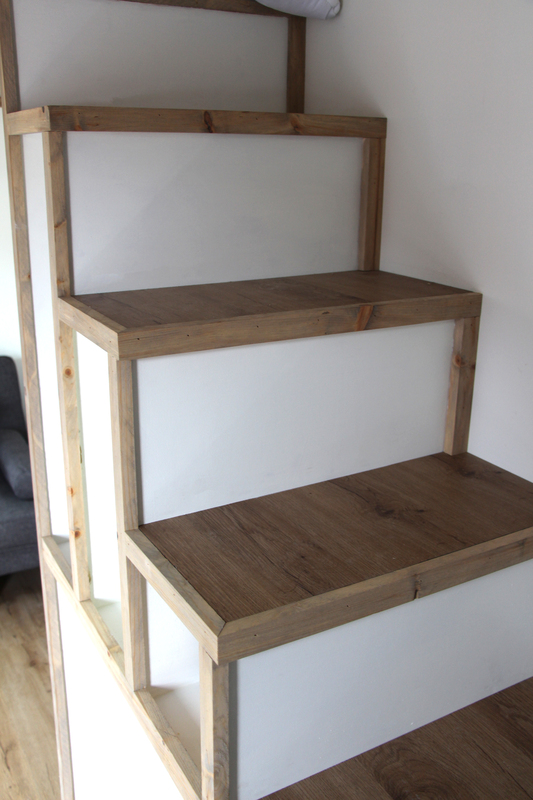 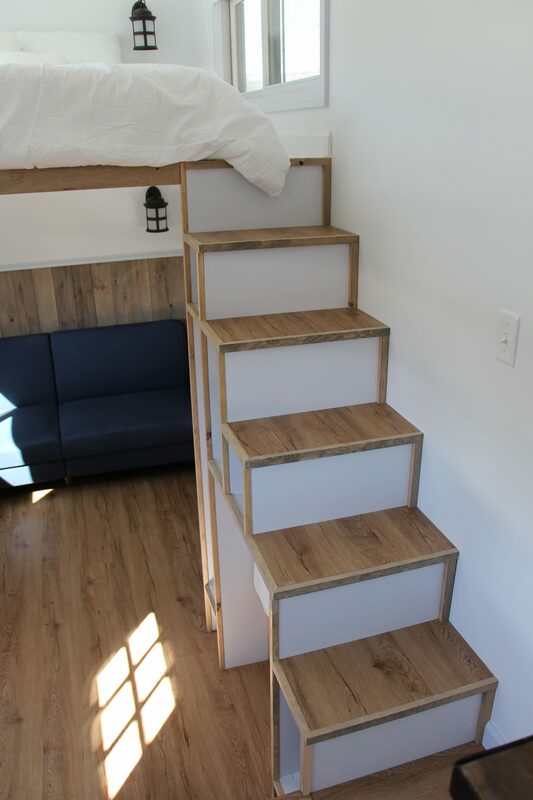 The stairs up to the loft have storage underneath. 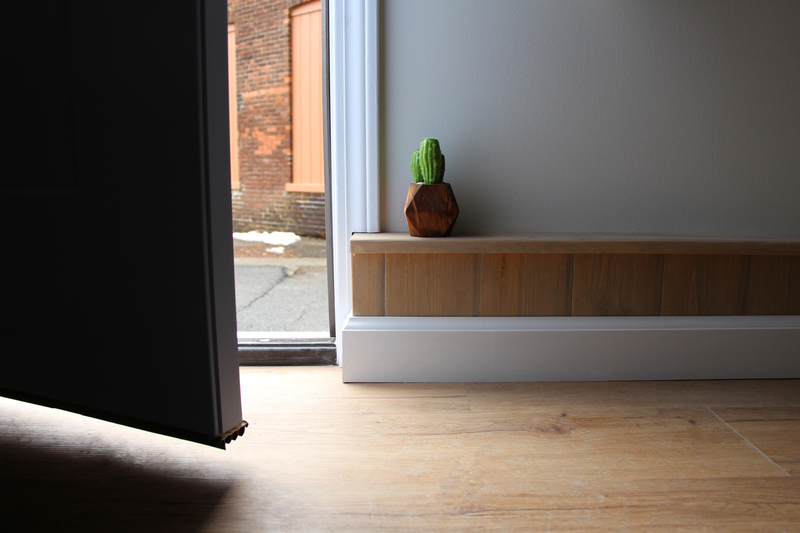 Optionally add a fold-down eating table to the left of the door. 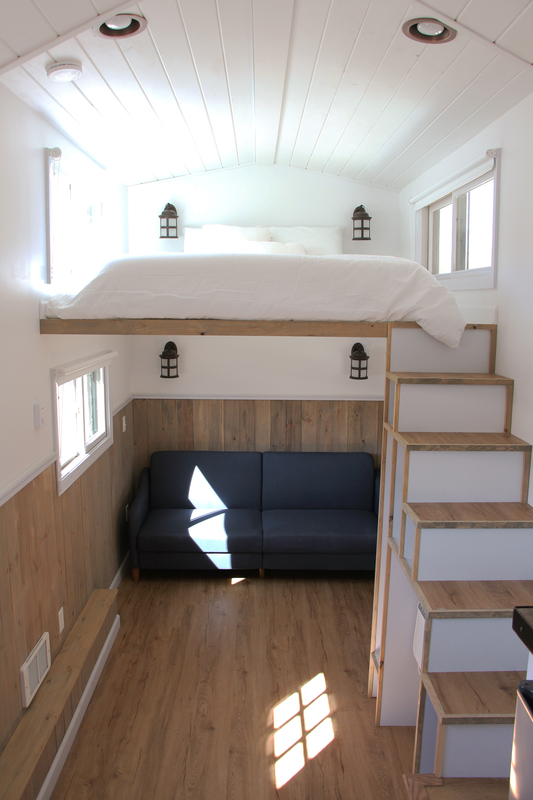 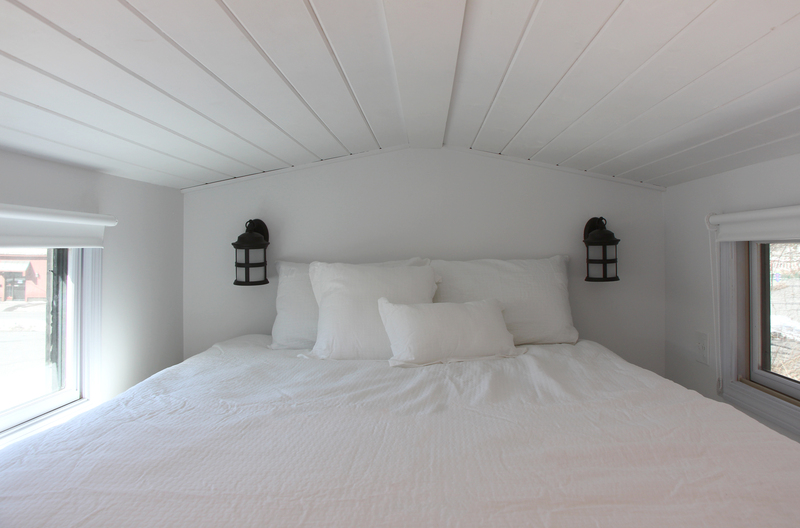 The loft fits a queen sized bed with extra space on either side for books and personal items, and has dimmable reading lights. 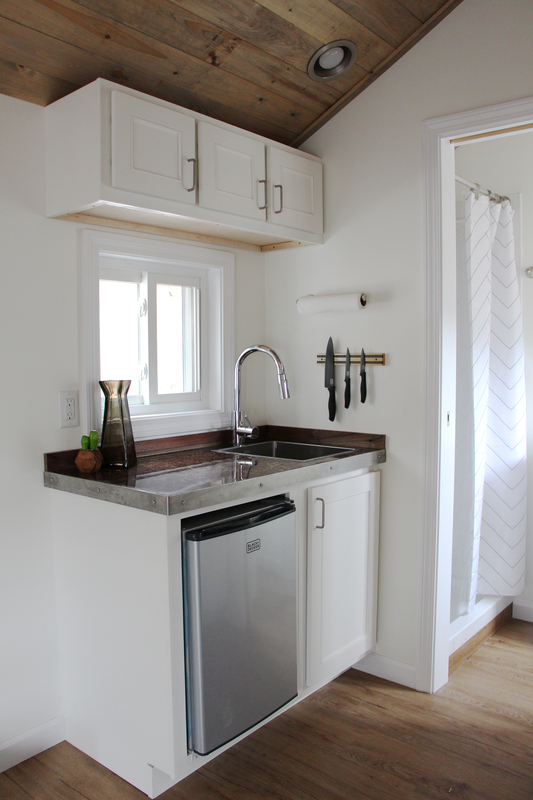 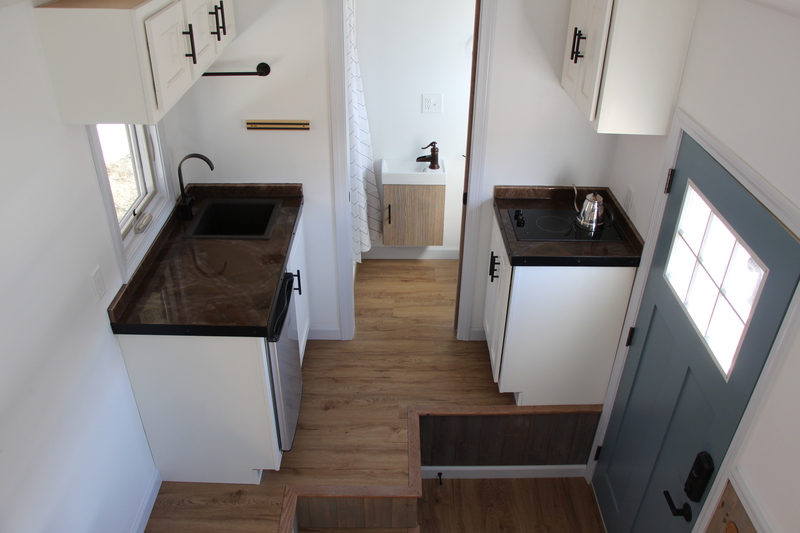 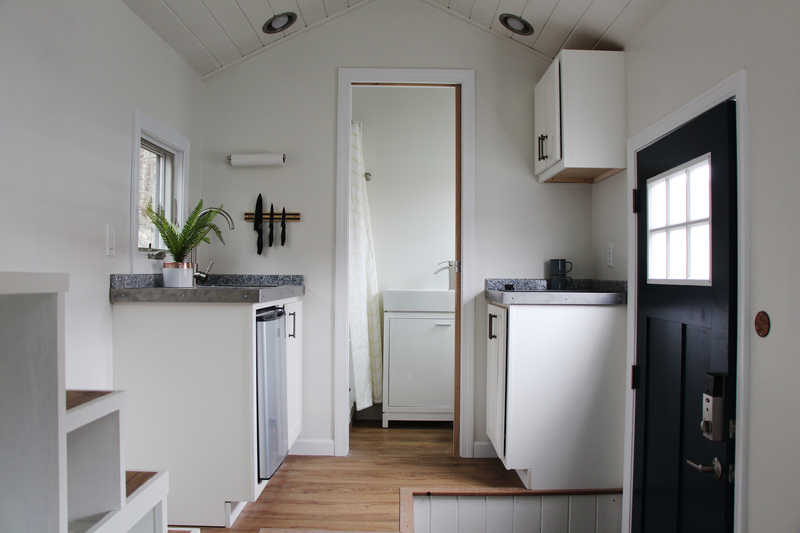 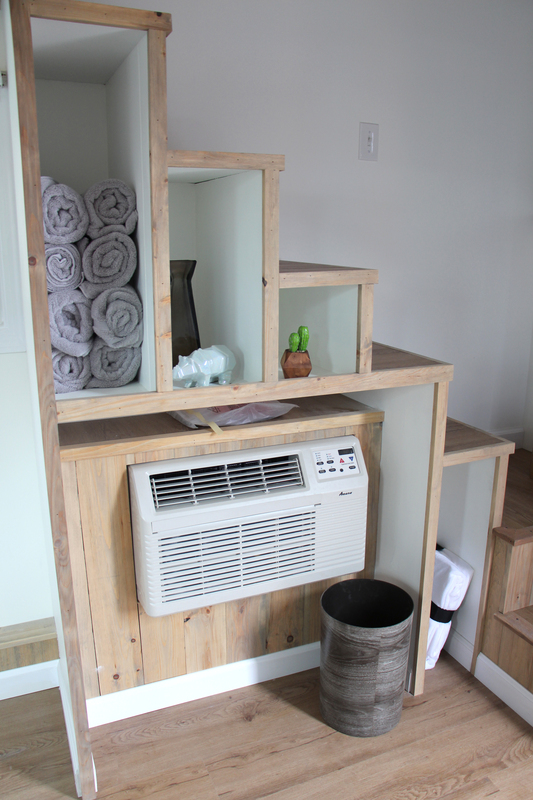 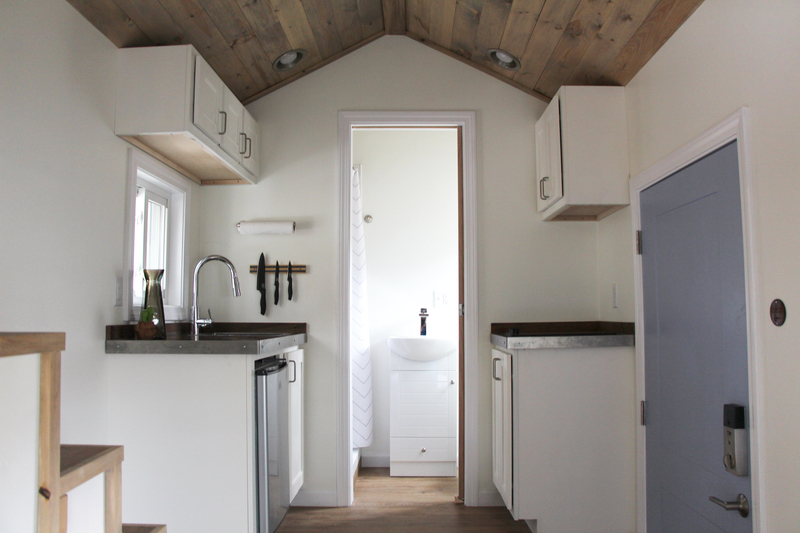 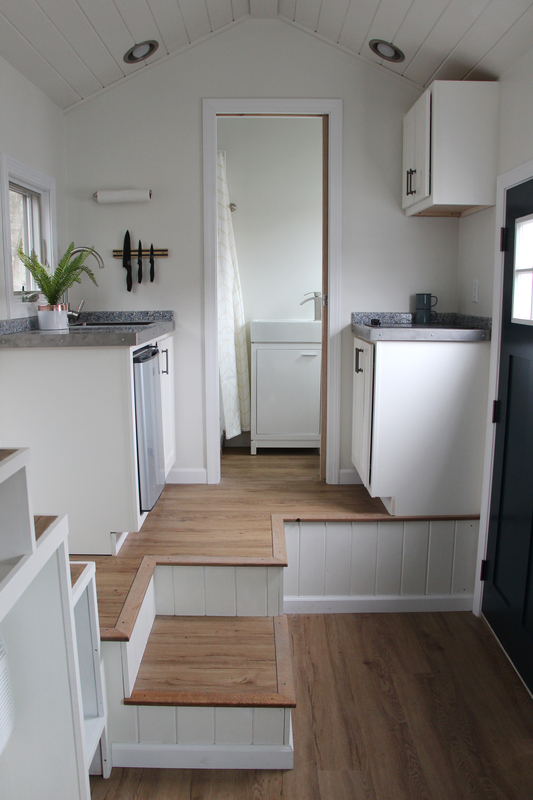 The Hoosic is a split-level tiny house: step up to the kitchenette and bathroom, which are elevated to fit the freshwater and blackwater storage tanks and water heater underneath (the kitchen can be on the same level if you do not require water tanks). 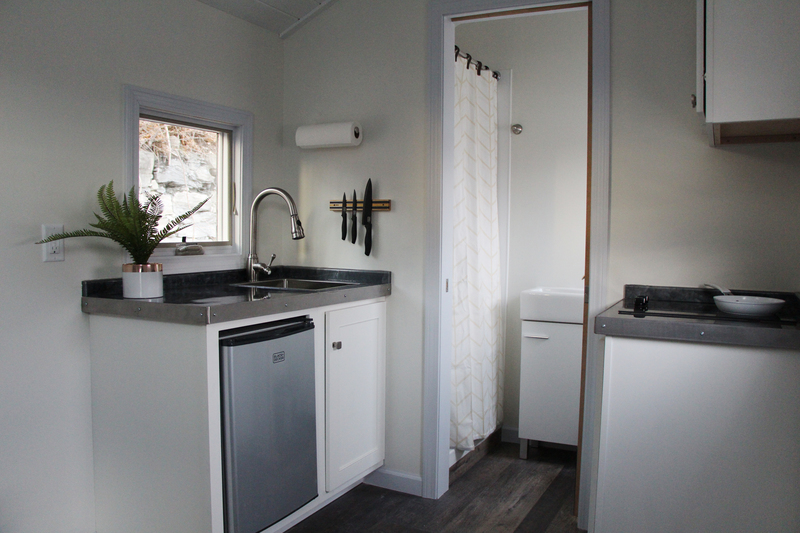 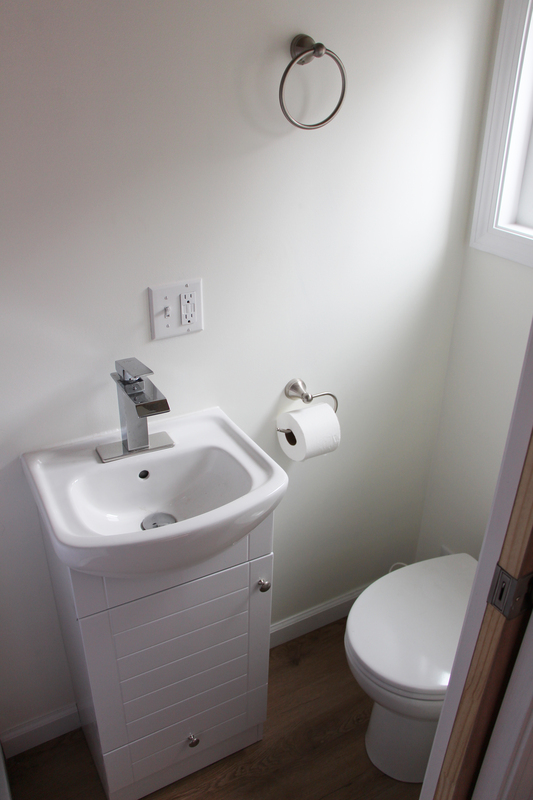 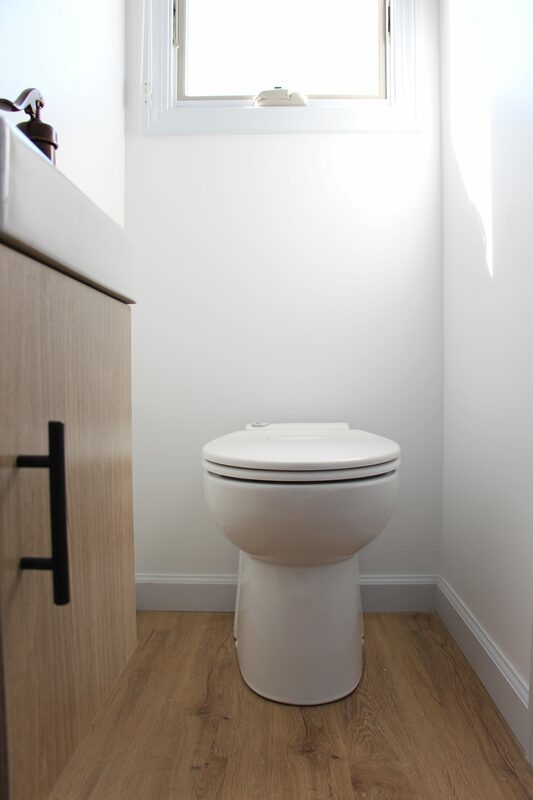 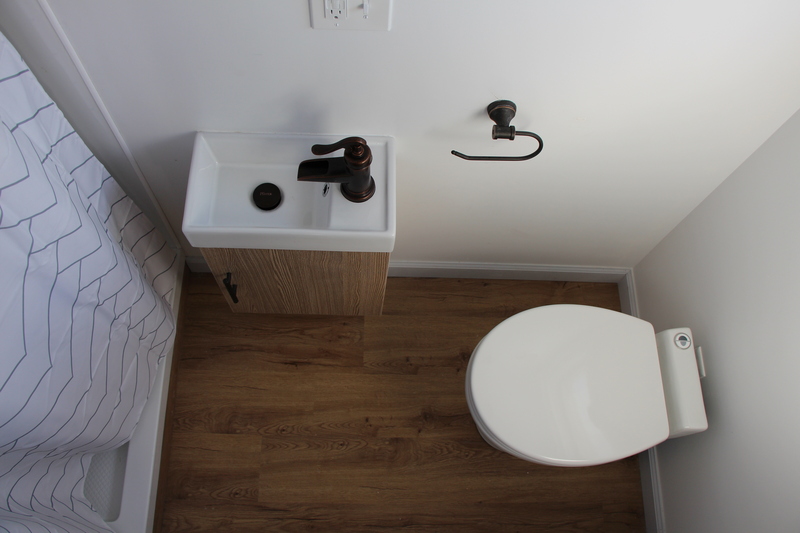 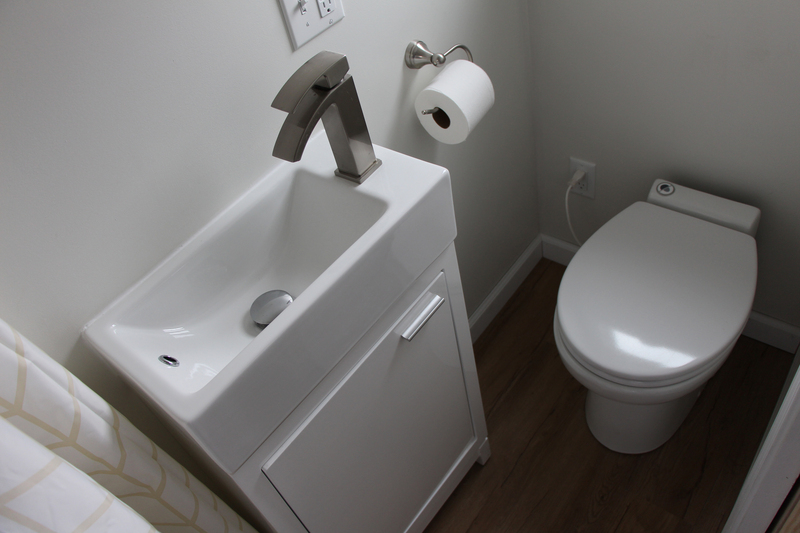 The bathroom has a full-size shower, sink and macerating toilet. 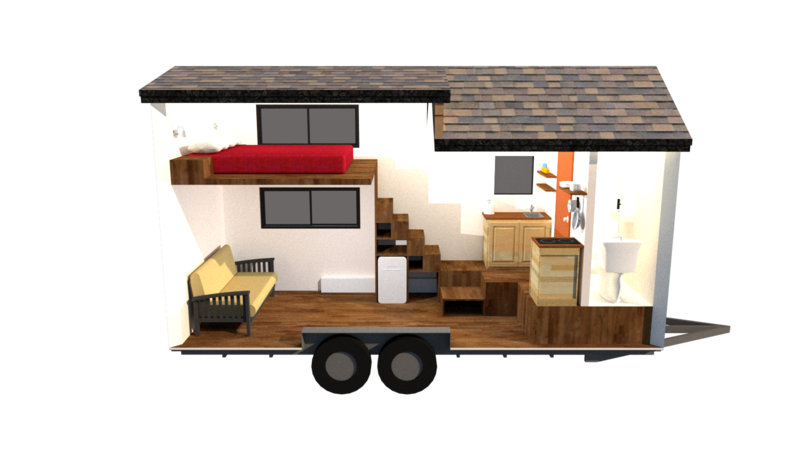 RV hookups on the outside of the house allow for easy power and tank access. 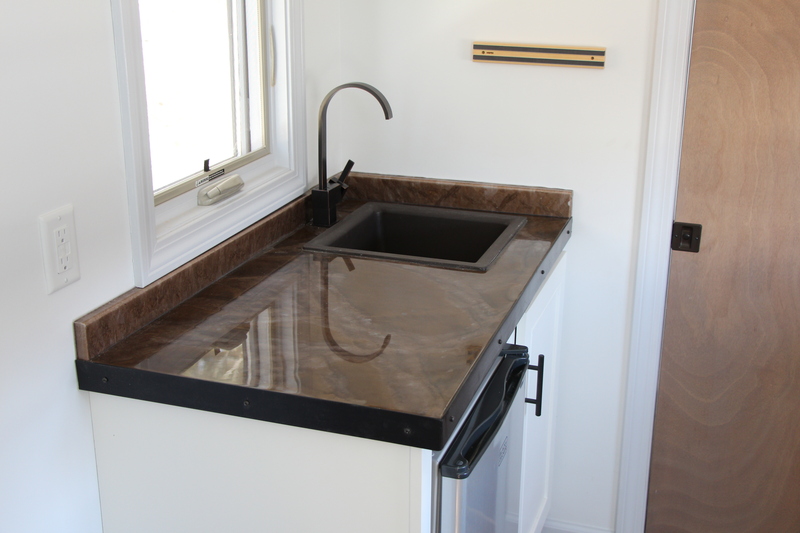 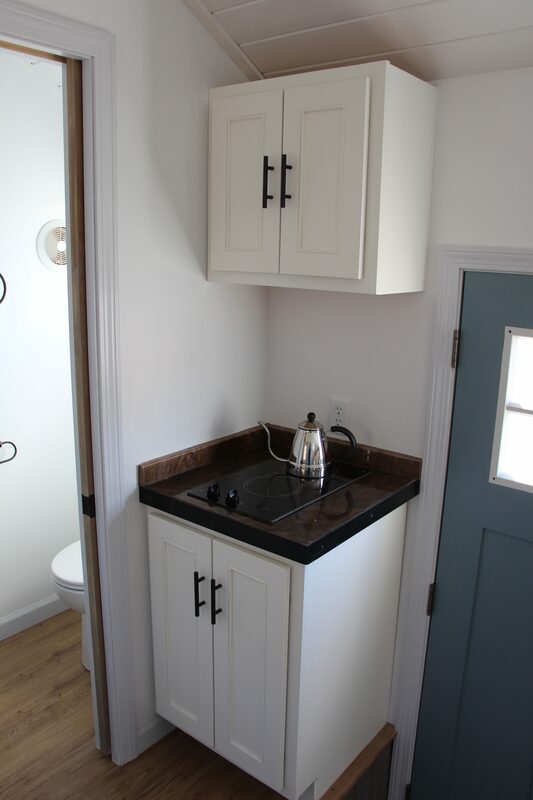 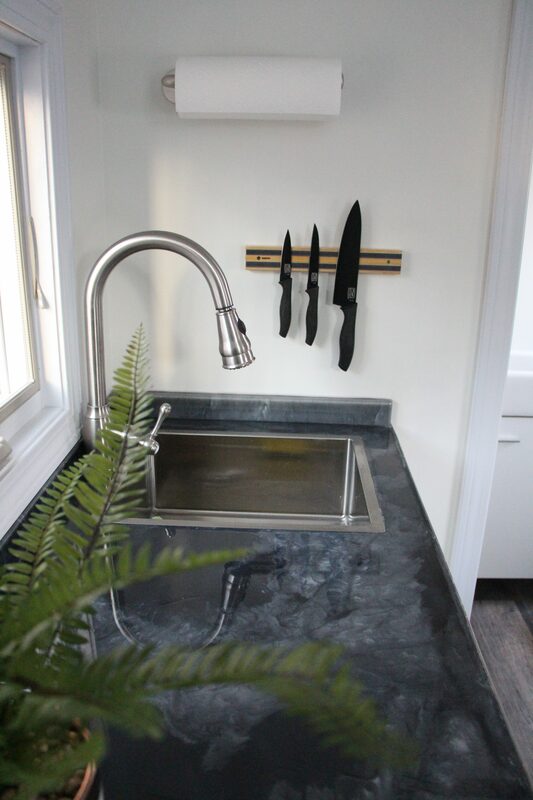 The kitchenette comes with standard cabinetry with a sink, two-burner electric cooktop, and mini-fridge; an optional upgrade to a propane stove/oven is available.